Rs.15,000/-per month for Data Entry Operator. GOVERNMENT OF TELANGANA, Animal Husbandry, Dairy Development & Fisheries Department- Permission for (189) Contractual appointments and Outsourcing of (16) services under the control of Commissioner of Fisheries, Hyderabad– Orders- Issued. From the Commissioner of Fisheries,T.S., Lr. No.1002/.A3/2017, Dt. 1.6.2017. ORDER: In the circumstances explained in the reference read above, Government after careful examination of the matter, hereby accord permission to the Commissioner of Fisheries, T.S., Hyderabad to engage(31) Fisheries Filed Officers,(79) Fisheries Assistants,(79) Fishermen on Contract basis and (16) Data Entry Operators on Outsourcing basis and fix the monthly honorarium @Rs.25,000/-per month for Fisheries Field Officer,Rs.18,000/- per month for Fisheries Assistant, Rs.12,000/- per month for Fishermen, and Rs.15,000/-per month for Data Entry Operator. 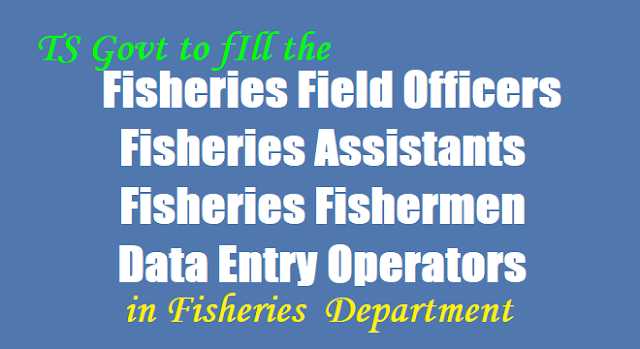 The prescribed qualifications and job description for Fisheries Field Officer, Fisheries Assistant, Fishermen and Data Entry Operator and the high potential and average potential Districts and District wise criteria for allocation of the above posts are annexed to this order. 2. The Commissioner of Fisheries, T.S., Hyderabad shall take necessary action in the matter accordingly. 3. This Order issued with the concurrence of Finance Department vide their U.O.Note.No.7932/314/A1/HRM.VII/2017.Dt:01.07.2017. 1. Implementation of NCDC scheme through TS FCOF and connected cooperatives in coordination with Department of Fisheries and will oversee the fish production, creation of infrastructure for fish seed production, processing and marketing and to develop trained / skilled manpower. 2. Identification of site, submission of proposals and grounding of NCDC schemes like construction of Landing Centers, Retail markets and Wholesale markets on 100% grant basis and processing units, feed mills, ice plants etc as per the requirement and beneficiary contribution on 75% subsidy basis. 3. Responsible for Strengthening of Fish Seed Farms in the Districts with coordination of District Unions. 4. Responsible for implementation of pen/cage culture by involving beneficiaries. 5. Identification of site, submission of proposals and grounding of NCDC schemes like Establishment of Fish Seed farms, construction of ponds, fish seed rearing ponds, Re- circulatory Aquaculture system by beneficiaries, Integrated Development of Reservoirs fisheries by the District Unions, Construction of landing centres by the Unions/ Societies, Feed mills, Establishment of Ornamental fish units, Ice pants, supply of net and crafts, Net mending units, supply of vending units for hygienic supply of edible fish to consumers etc., under NCDC Schemes. 6. Stocking of fish seed supply on 100% grant in all water bodies. Responsible for fish seed production management. Running fish seed hatcheries on the lines of production concern operations throughout the clock. Management of different hatcheries and a constant vigil to reduce mortality of tender fish seed in hatching, predatory, insect and weed control methods. Nursery management manuring, primary productivity, rearing of hatchlings to fry and fingerlings. 7. Survey of inland water sources for suitability and potentiality, supply of quality fish seed or stocking in composite fish culture methods. Proposed academic qualifications:1st Preference will be given to B.FSc.,. If candidates are not available, it will be filled by M.Sc., (Zoology) with Fisheries Specialization or B.Sc (FZC.,) in that order of priority. 1. Assist the Fisheries Extension Officer in implementation of various Fisheries Developmental schemes and Welfare schemes which are being implemented under the NCDC Schemes.2. Assist in survey for availability and procurement suitable breeder fish, pituitary glands and other material required for induced Breeding experiments of fish.3. Assist in management of nursery ponds, rearing ponds, and other ponds in the fish seed farm for de-weeding, manuring and feeding of fish seed etc.,4. Assist in Hatchery operation throughout 24 hours in fish breeding season and maintenance of power and water supply system when the hatchery is on operation.5. Assist in transport of fish breeders and transport fish seed in plastic bags filled with oxygen packing.6. Assist in Departmental exploitation of fish in specified tanks, marketing and collection of fish production data and mode of disposal at nearby markets. Proposed academic qualifications:1st Preference will be given to Polytechnic in Fisheries, if no candidates are available, it will be filled by B.Sc (FZC.,) in that order of priority. 1. Assist in catching the breeders from the available sources of water with cast net/drag net, select healthy suitable fish based on symptoms.2. Responsible for erection of breeding hapas /hatching hapas for breeding of fish suitably.Handle the breeders most carefully during breeding season as they are most sensitive and mishandling leads to not respond to breed even after pituitary injection.3. Attend for cleaning of nursery, rearing ponds, filing up them with clean water, manuring, applying soap-oil emulsion for removal of insect predators.4. Feeding of Fry/Fingerlings/Breeders as per the schedule of feed given for ponds.5. To catch fish seed with suitable nets, packing with oxygen and transport.6. To sample collections of fish with suitable craft and nets.7. Assist Fisheries Assistant in all activities entrusted to them and work as a team8. Working closely with the Fishermen cooperative societies in implementing various activities under NCDC scheme. Proposed academic qualifications:Degree with Computer Knowledge of typing in English and Telugu.